On June 30 2016, the government announced that it would receive $ 500 million in compensation from Formosa to pay for its residents in August. By September last year, the government said it would complete the compensation in October. This promise was moved to June 2017. On 11/10/2016, the Ministry of Finance said it had transferred 300 million USD to compensate the local people. On 8/2/2017, the Ministry of Finance forwarded 168 billion VND to the second phase. Total spent 4680 billion VND out of 11.5 billion VND received from Formosa. After the catastrophe that took place in April, the government received compensation money by June, but when 29/09/2016 came, the compensation was not released to the people. However, many are missing out on the real damage. By March 9, 1977, only one of the subjects was added to the Prime Minister's Decision No. 309. The mainstream media reported that people are excited and agreed with the government's compensation decision. But in fact, almost all locals have complaints because they think the compensation process is too slow and unfair. A handful of online articles were posted but shortly thereafter was deleted from the homepage. There is an underlying directive on limiting negative news about this process. 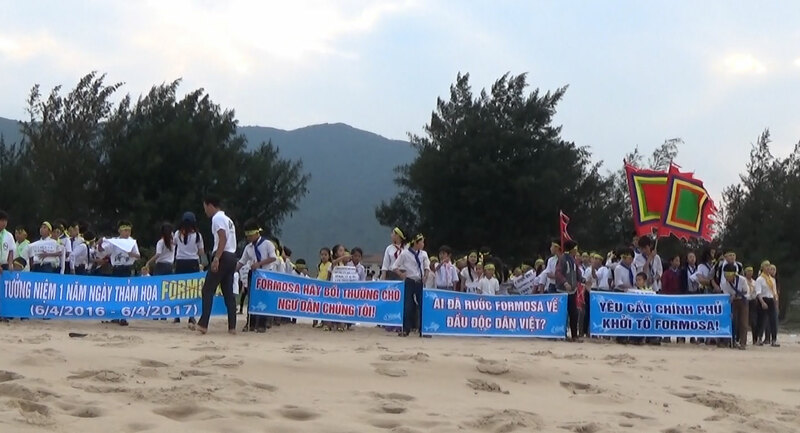 In Ha Tinh, the authorities have reported to release more than VND1 trillion in compensation to the people, but in the communal, district, and provincial administrative agencies people are demanding money every day. Dang Quoc Khanh's home, Chairman of the provincial People's Committee and Dang Ngoc Son, vice chairman, were frequently complained of by the residents. The complaint status is still central when Dang Ngoc Son has to travel to Hanoi several times to negotiate the proposal. Many people in some places have repeatedly organized demonstrations related to compensation. In particular, many demonstrations in places such as Ky Anh (Ha Tinh), Quang Trach, Ba Don (Quang Binh), ... have repeatedly blocked traffic on the Highway for many hours. On April 3, 1977, the demonstrators also occupy the headquarters of Loc Ha District People's Committee when district officials did not appear to respond to their requests. Other provinces have similar situations. It was a real chaos on a stretch of several hundred kilometers of coastline. First, is the delay, shortcomings in the decision issued from the Central. Receiving money from the end of June but September 29, the new Prime Minister issued a decision 1880 compensation compensation limit. However, many real damage objects and great value were ignored; Such as seafood restaurants, hotels, resorts. 3/7 of the victims in this 1880 decision do not have a specific amount. On March 9, 1977, Secretary Truong Hoa Binh signed Decision No. 309 supplementing only one subject is irregular coastal labor, with a norm of 1,405 thousand per month and restaurants and hotels are only compensated. Labor, other damages are not compensated. At the same time, these decisions specify that only communes and wards are entitled to compensation; Neighborhood communes, no matter how much damage is ignored. Owner of Hai Duong restaurant, chapter on Ho Do bridge (Thach Ha district, Ha Tinh city) said that in 2015 they pay tax nearly 500 million, but now suffer heavy losses without compensation. The calculation of compensation amounts in many cases is confusing, complicated and beyond the capacity of local officials. Second, the compensation amount is not enough compared to the current loss of the people and only compensated within 6 months, from 4-9 / 2016, the next time damage is not paid attention. Seafood traders and traders claim that their actual income in the absence of disaster is many times greater than the figure of 2 910 thousand per month. Similarly, owners of fishing vessels and fishermen claim that their income is enough to support their family, which is higher than the amount of 3,690,000 VND per month as compensation. At present, many fishermen have quit their job to do other jobs because the current seafood price is too low, can not continue to work. Many other industries, such as aquaculture or services, must continue to be suspended or damp indefinitely. Third, at the local level, the level of cadres restriction and bureaucratic work habits, lack of transparency. According to the Ministry of Agriculture's guidelines on injury claims, each hamlet has a public evaluation and appraisal panel. However, with limited level and type of authority, culture familiarity many people cause urgent. Specifically, there was a village chief in Thach Kim, Loc Ha, Ha Tinh who was thrown into the house by the problem. When the dossier is declared by the commune or district level, many cases are removed from the compensation list without notification of the reasons. People in Ky Phuong and Ky Nam and Ky Anh communes repeatedly blocked National Highway 1A to protest because when listing the compensation list, they were accidentally stripped of their name and the village or village supervisor was not. Asked what the reason is. People's perceptions are heightened when the capacity for local dialogue is weak. People are questioned by the authorities, officials are responsible for avoiding and rarely responding to requests from the public. Fourth, from the people, there are still many cases of false declaration and limited knowledge. Some newspapers have reported support from village officials, so there are some cases where melon traders in the market are still compensated while labor related to the sea is not. This contradiction and lawsuit are complex. Many people claim rights without access to the relevant documents, resulting in poor reception by the receivers. In fact, many of the communal cadres, when people make the Decision 1880, claim that they do not know this document. This does not understand the reason for the weakness, neglect of the local level or other reason, but currently the Decision is supplemented by 309, an important decision regarding compensation does not exist at the Gates. Government electronic information while other documents are available. It must be asserted that $ 500 million is too little compared to current and future actual losses. The government must admit this is a mistake because it automatically received money without a quantitative assessment as well as consultations from people and experts. One of the main causes of the slow, chaotic compensation process is now rooted in the government. However, the capacity of local administrators can not be changed immediately. It is impossible to claim more compensation from Formosa. The working habit of a totalitarian government is to always solve the problem on its own, such as getting $ 500 million in compensation without the people being consulted. The government must really recognize the problem and call for social participation in paying compensation from Formosa. First, there must be a transparent, independent monitoring mechanism for reporting damages. In addition to party organizations such as local associations, the involvement of civil society in monitoring and supporting the compensation process. At present, this participation is not encouraged nor restricted. For example, few law offices in Ha Tinh province dare to receive the claim of the people because of the concern of the authorities inquiring, and harassing. Licensed civil society organizations also forsake this confused central land strip. Unlicensed civil society organizations are badly sanctioned by the authorities and strictly prohibited. In addition, the government must also consider issuing full payment schemes, directing and assigning personnel directly involved in this compensation. The instructions are flawed, ambiguous but with limited local qualifications beyond their capabilities. The problem of compensation now is like a spring that compresses the frustrations of the people with their almost overwhelming livelihood problems.